For some water-focused travelers, the Nile and Amazon make prime destinations. But authors Janisse Ray and Dorinda Dallmeyer are focusing on rivers closer to home. 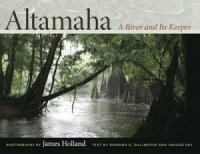 Their book, "Altamaha: A River and Its Keeper," highlights South Georgia's Altamaha River, which is the largest free-flowing on the East Coast. Running about 137 miles, the river has served as a water source for several of Georgia's major towns, such as Milledgeville, Macon and Brunswick. Ray and Dallmeyer collaborated with James Holland, who served as the first river keeper in 1999 and took stunning pictures which detail and illustrate the beauty of the area. During a Sunday afternoon reading at Avid Bookshop, Ray and Dallmeyer explained their connection to the river and their experience writing the book. Capturing the river, its history and its wealth was one of the major motivators for writing the book. Dallmeyer, director of the University's Environmental Ethics Certificate Program, they hoped to highlight a vital natural resource that almost no one outside of South Georgia knows anything about. "We have so many people who live in the Metro Atlanta area that unless you have some connection to south Georgia you really don't pay any attention to it," Dallmeyer said. "It's a real cradle of biodiversity, and it's something that has had a very rich history. People have used it for thousands of years, and it was the way that people in the interior got all of their crops down to the coast, a long time before the railroad. People say the Altamaha is Georgia's Amazon, and I say that the Amazon is Brazil's Altamaha. We need to know more about what we have here and appreciate it." Authors gave background about themselves and the work before reading small excerpts from their favorite sections. After that, the floor opened for questions from enthusiastic audience members, many of whom expressed deep interest in ecosystem conservation, especially in Georgia. Avid Bookshop owner Janet Geddis said author readings are an excellent way to connect the author to their readers. Avid Bookshop's quiet feel allows for a still connection to the Athens community. Having the event in a small, independent bookshop allows for a sense of intimacy and connection that would not be possible if the event were at a large store. "It gives them a chance to have a really personal interesting interaction with authors that are either just starting out all the way to people who are bestsellers," Geddis said. "It's such an intimate environment that I feel like most of the customers we've talked to have really enjoyed getting to meet authors one on one. It feels a lot more personal than going to a huge store or a gigantic venue to meet people. It's mainly just so people can interact and hang out. For people who love books, it's awesome to be able to meet writers that you admire." A sense of community and connection local art is something both Avid and the authors of "Altamaha" strive for. During discussion, Ray, an author and environmental activist, gave a described passionately the importance of rivers in local communities. "A river is continually renewing itself. It's constant change. What is the river? It's just this bunch of water that's moving. Is a river the water? No. That's always changing. Is it the bed? No," Ray said. "It's like a corporation. A corporation is just a pile of money that people pay allegiance to. A river is the same thing. It's a pile of water that symbolizes a group of people and their connection to place. It symbolizes what life itself is, that journey to death."